So, the Amy Gillet Gran Fondo.... twice. The ridiculous idea of doing the AGGF loop twice started a few weeks ago for me. I got a message from my mate Ryan, it went something like this. 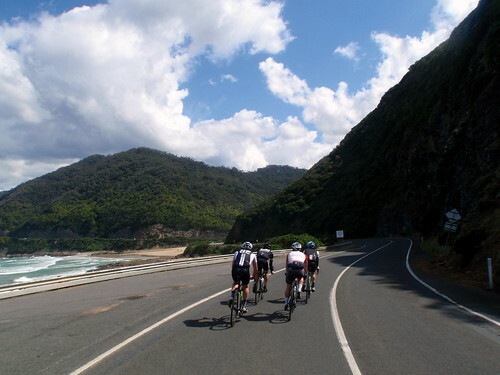 "Just putting it out there.... Amy's grand fondu...... [Darren] Baumy and I are doing 2 laps.... Join us!". Obviously this was a ridiculous idea, one any sane person would be wise to decline. So after the promise of a coffee between laps, I pledged I was keen. Back to today, most people were obviously sane and only doing one lap. This meant that their needs and mine were going to be wildly varied, but somewhere in the overlap was an opportunity for me to sit on wheels and get the first lap done as quickly as possible with as little effort as possible. 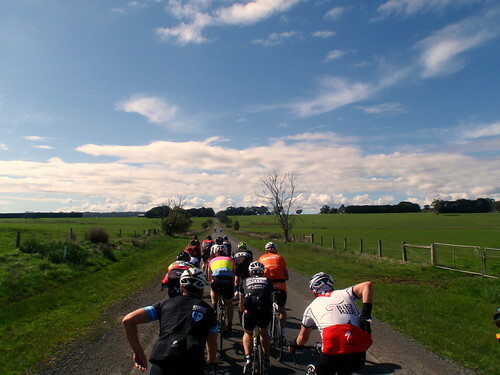 I set off with the 2nd wave of riders and followed wheels as Wilko and the Llama bridged us over to the first group. From there I slid my way up until I found riders who's skills I was comfortable with, and enjoyed the benefit of others pushing the wind for me. 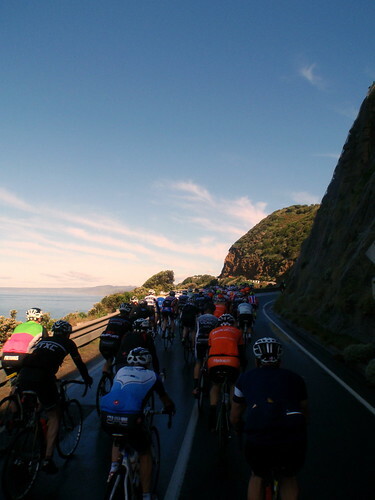 When we turned into the bottom of Skenes Creek rd, I pulled to the left with Moody and set about setting about while everyone else played games with each other up the climb. Yeah.... nah. 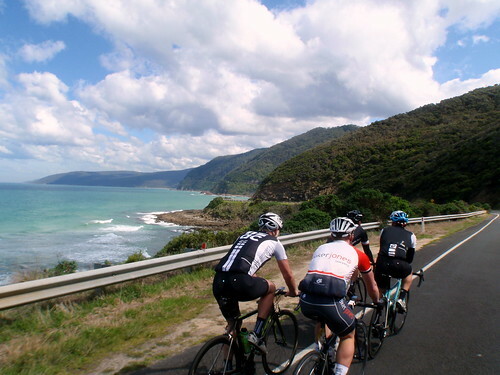 From there to the end of the first lap, I didn't feel any pressure, I made sure I saw as little of the front as possible, then wandered my way up the back of Mt Benwerrin, regrouped with Ryan and Baumy, then headed to Lorne for a coffee and a smoked salmon omelette. The second time around... David Baker joined us for the full loop and Dan Strauss came to Skenes Creek. I expected I'd go to a really bad place somewhere along this loop, but by keeping my eye on my power number(s) I stayed within myself and got the job done. 330W, that was the number I tried to stay below for the climbs, far enough below threshold that I didn't fear cramps, but decent enough that the pace didn't slow to a crawl (though my cadence did). Dark place or not, it was a very different experience to the first time. There was more time to look around, more time spent chatting with mates, and this time we stopped in Forrest for a bowl of coffee and a chat with the kind folk that run the brewery. I looked longingly at their frosty taps, "beer is filled with energy" I told myself, but as convincing as I was (I'm pretty convincing) I knew that any amber draught that touched my lips would spell the end of my endeavour. Km by km we got closer to the end, but for me it wasn't until half way up Benny, a gel slowly trickling through me, that I started to feel that the end was inevitable. I pushed on to the rolling hill section with a grin on my face. That grin was only to be surpassed by the one on the trip back down to Lorne. Not only was the job totally done, but that descent is one of my favourites. crazy man crazzzyyy! shattered i was too consumed in that steak sandwich..
Two laps? Epic. The last epic I saw involved two girls..... and one cup. Dan: it was a good looking sammich, it made me regret my omelette choice. Don't worry, there will be enough stupidity on Saturday for us to share. Shane: A little bit epic, but not as epic as this party I once had... a lemon one. That comment put me into a spin. Time for meat. your mind needs washed out, to the tub, girl.